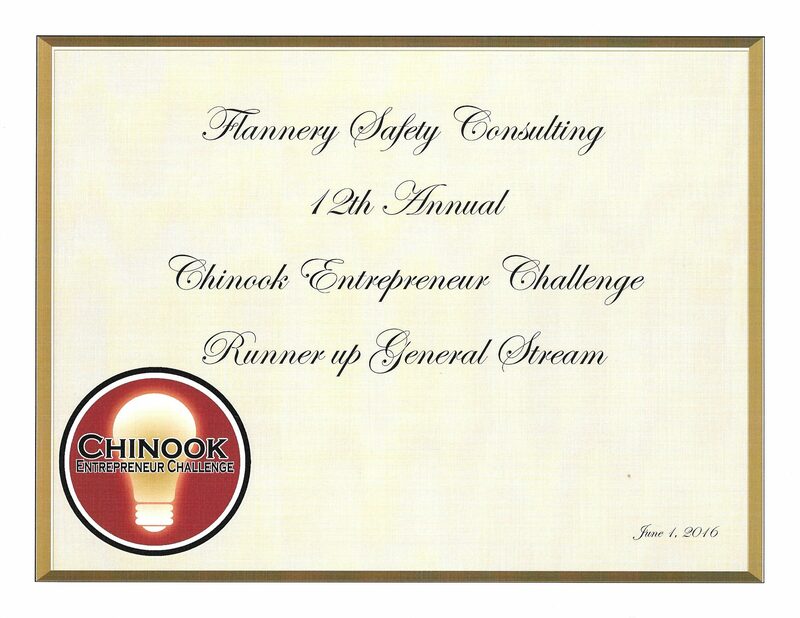 Flannery Safety Consulting decided to throw its hat into the ring this year and compete in the Chinook Entrepreneur Challenge. As noted on their website, the Chinook Challenge “is a business plan writing competition designed and targeted toward new or existing business (individuals or teams) who have a sustainable and high-growth business idea.” We thought our business plan was pretty strong so we made the decision to submit it and see what happened. Well, on June 1 of this year, we were named Runner Up in the General Business Stream (the Challenge also has a Technology Stream for high-tech business ideas). 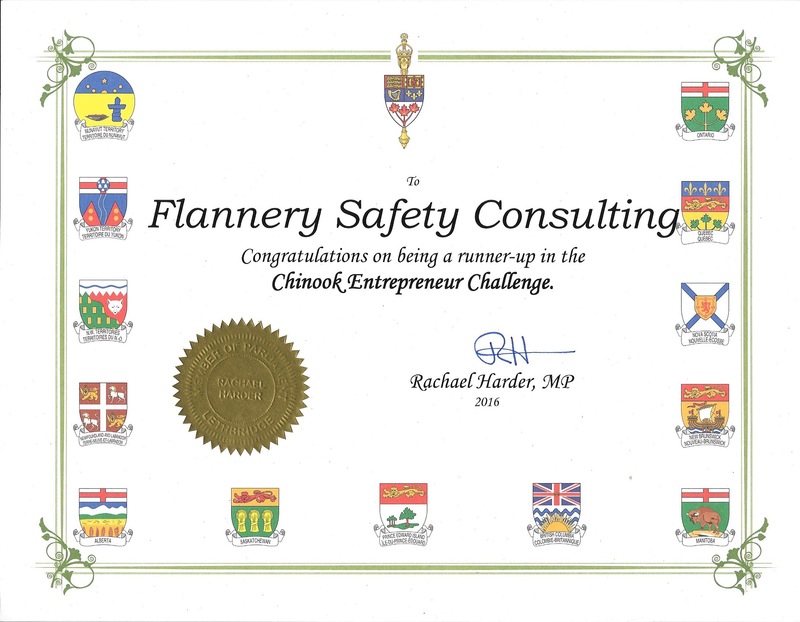 Considering that Flannery Safety Consulting is less than a year old, we’re living in a city that is still relatively new to us, and that I’m not an entrepreneur by nature, this was a huge honour. Being named a finalist was pretty exciting all by itself. It told us that our business was on the right track and that professional business people looking at us from the outside thought we had a good and sustainable business model. I’ve felt pretty good about our prospects since starting this venture, but having that feeling reaffirmed was really satisfying. I can’t emphasize enough that this award would not have happened without a ton of help. My wife—who is assisting me with keeping the books, transcription, paying the bills, and more—was invaluable for her work on the cash flow analysis, doing research, and the subtle but critical task of formatting our submission. We would have been dead in the water without going through the execuserv plus Self Employment Program, which gave us the tools to actually make the business function as well as training us on how to write a good business plan. Without the guidance we received by going through this program, I doubt we’d still be in business today. I also have to thank my friend and mentor, Kelli-Rae Ennis of TMH Business Coaching, who had some great suggestions on how to improve our business plan and who has been a cheerleader and source of inspiration to us from the day I decided to give this whole self-employment thing a try. I also have to thank my network of business associates through BNI Key Connections. Trying to get this business off the ground and find clients without this great group of people lending a hand would have been difficult, if not impossible. Getting recognition from the Canadian Federal Government was pretty cool, I must say. Thanks to our MP, Rachael Harder for the certificate and the congratulations! This entry was posted in Uncategorized on June 30, 2016 by Jim Flannery.